Conceptual event design. Vectorworks and Photoshop rendering. Vectorworks & Photoshop rendering for the Ears Up Design Studio, a prototyping space for sound and multimedia design located in Glendale, CA. 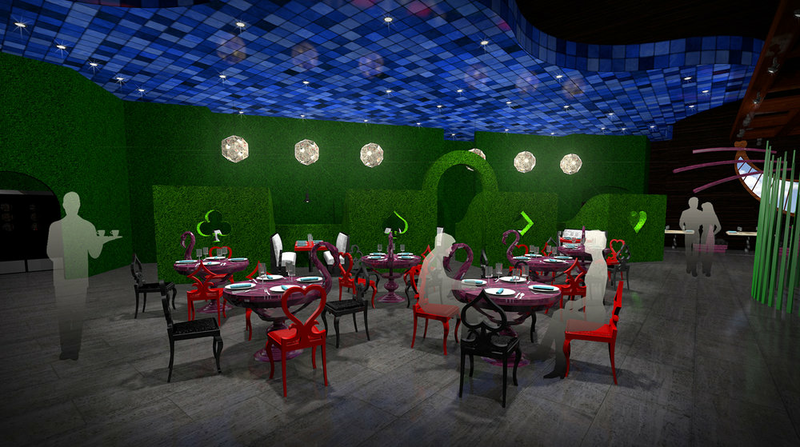 Mirabili is a themed restaurant design inspired by Lewis Carroll's beloved 1865 novel Alice's Adventures in Wonderland. The design aims to create a sophisticated dining space with subtle references to the original text. It is classy and inspiring, meant to be enjoyed by everyone, not just children. Conceptual renderings created in Vectorworks. Entering the waiting area, guests are greeted with a circular foyer with seating around the outside. The walls are a textural entanglement of roots and vines. We are at the bottom of the rabbit hole. Looking up the tall cylindrical chamber we see the hole through which Alice fell, with force perspective trees towering overhead. Hanging within the space is a chandelier composed of marmalade jars, a specific item from the original story which Alice saw as she fell. From the waiting area guests walk through this archway to the host station. The host's station is this whimsical glass table (referring to the glass table in Carroll's text), with the Mirabili logo emblazoned into the metal leg caps. Guests now enter the restaurant through the Hall of Doors, each a different size to reflect Alice's fluctuating scale. The motif on the front of each door adds to the sense of recursion. At the the end of the hallway is the white rabbit's giant pocket watch next to a tiny door, again referencing Alice's shifting sizes. Guests can glimpse into the garden area through the tiny door, just as in the story. The glass teardrop chandeliers overhead emulate Alice's tears as she begins to cry, and the elusive key appears in the wallpaper pattern. The largest door in the hallway (and the only practical one) leads into the first dining area: The Mad Tea Party. The Mad Tea Party area features a hodgepodge collection of eclectic chair and table styles, unified only by their finishes. A long communal table runs diagonally through this section, allowing multiple parties to socialize together, just as Alice sat at a table with many new faces. 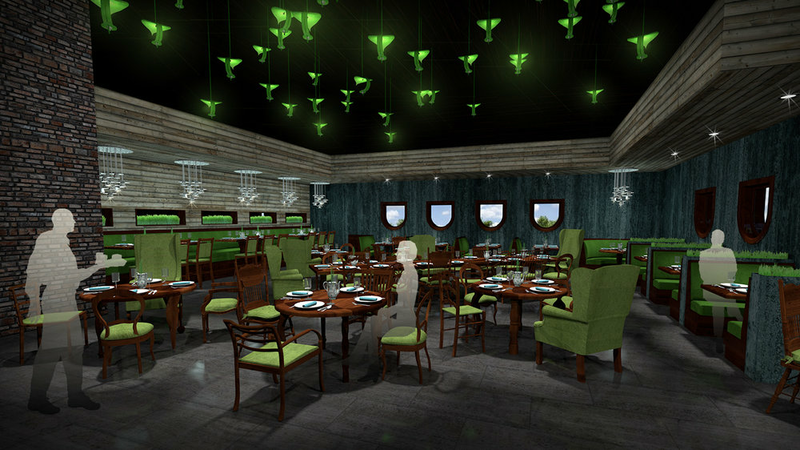 Inverted tea cup chandeliers hang over the high table area. On the outer walls are booths with abstract tea cup shaped windows. Overhead are the leaves of the tall tree which hangs over the Mad Tea Party. Each leaf is illuminated by its own light, and the is sleekly suspended by its power cord. The opening in the tree leads back to the Hall of Doors. The walls on either side of the tree are covered in a mirror finish, making it appear as though the tree circles completely around. This makes the doorway more of a "portal" into another world. From the Mad Tea Party section we can see to the next area: The Queen's Garden. The Garden is where the Queen of Hearts plays croquet with flamingoes, which have been reimagined as tables. The playing card soldiers have become the chairs, representing the four suits of a deck. The dividing wall hedges provide privacy to each booth. The hedges are made of a shag damro rug material, and feature cutouts in the shapes of the four suits. Overhead are chandeliers made out of playing card shapes. This wall features a light art installation, with the Queen's roses (some of which have been "painted red") glowing and pulsing, each embedded into the wood veneer wall. On the other side of the hedges are more booths and two-tops. All of the booths feature a fabric pattern composed of abstract hedgehogs, which are the croquet balls in the Queen's game. The brick structure at the center of the room represents the White Rabbit's house, in which Alice grows giant. Along the outside of the house, Carroll describes a series of "cucumber frames" (gardening compartments) which have been re-imagined as private dining booths. On the other side of the window openings is the Mad Tea Party area. Parties of up to 10 may enjoy being seated in this section, where giant grass blade dividers make guests feel as though they've been shrunken down. Inspired by the section of the story in which Alice meets the hookah-smoking caterpillar, the tables here are giant mushrooms with hookah-shapes lamps at the center of each. 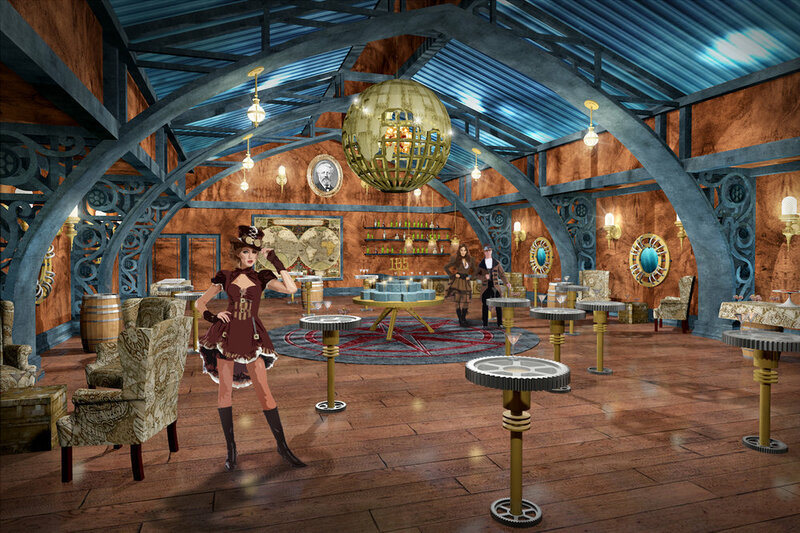 Perhaps the most obvious reference in the restaurant is the large window in the shape of the Cheshire Cat's smile. Playing card table line the outer walls. The Cheshire Cat's whiskers are hanging sculptural elements. Sitting in one of the outer booths guests may look back and see the rest of the restaurant.